Chalkdown Group now has five of its own ponies and four that are brought to us each week by their owners. We thought you would like to meet them. This is our very handsome bay RDA pony Jimmy. He is 8 years old and is a 14.1hh Connermara X. Jimmy joined Chalkdown Group in the summer of 2016 after a huge fundraising donation from Dulwich Prep School. He is a very genuine, kind gelding and has become a firm favourite with our riders. He lives with our volunteer Jedda and her daughter Hope. 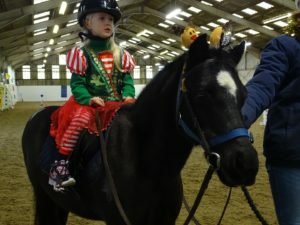 Last year he did an endurance ride with Jedda and raised over £500 for the Group. 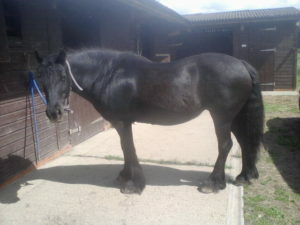 Lara is a true 'leg at each corner' Fell pony, who is 13.2hh and 22 years young. She's exceptionally quiet and safe and is the pony we trust to look after the most nervous or unbalanced riders. She is on permanent loan to us as her owner now lives abroad. She lives with Fenella and Finn, who she likes to boss around, especially when there is any food on offer! Fenella is a 14.2hh Highland pony, who is 17 years old. She has been owned by us for 13 years, and so is an 'old hand' at the job. She is very comfortable to ride, with really smooth paces and a soft treeless saddle - it's like sitting on a sofa! 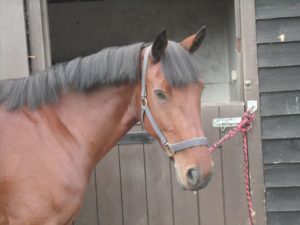 At home, she is a very kind and well-behaved mare, who loves nothing better than a vigorous groom with a curry comb to get through her thick hairy coat. She is generally happy to live out in the field with Lara (who always tells her what to do) and Finn, but when it's muddy she prefers to come into her stable to eat a delicious hay net that she doesn't have to share! Chase is brought to us each week by his owner Kay, who also brings along his field mate Frannie. He is a very pretty pony and has a fancy long name, “Waitwith Windchaser”, but we prefer Chase for short. 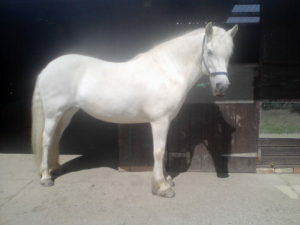 He is 8 years old and is an 11.2hh Welsh Section A. He is very cheeky but also has a kind, gentle nature. He gave us all a scare in November 2017 when he was rushed to the vets as he was so poorly. However, with fantastic care from Bell Equine and his owner Kay he has made a good recovery and we are looking forward to welcoming him back to RDA in 2018. 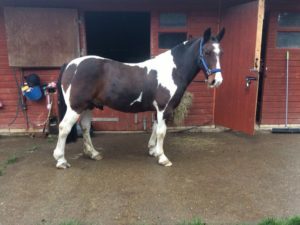 Finn is a beautiful, big, tri-coloured cob who is 16 hands tall and 12 years old. He might be our biggest horse but he's a gentle giant who likes nothing more than lots of attention and cuddles and the occasional polo or two! He is strong enough to carry all our larger riders but gentle enough to look after any of the smaller children who wish to ride him too. Finn was loaned to us every week until we bought him last summer from Karen. He now lives with Fenella and Lara and is looked after by our Coach Emma. He is much loved by all. 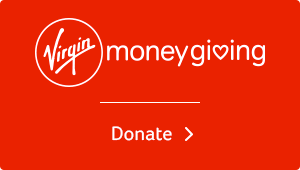 Charlie joined us in October 2017 after much searching and fundraising. 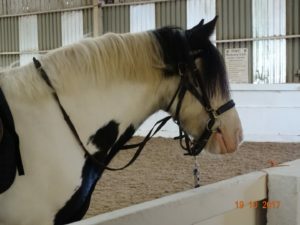 He is a beautiful skewbald cob with a sensible, calm temperament who has taken to his new job very easily and is gradually being used for more and more riders. He lives with our volunteer Kay and her other ponies and is ridden by all the family. Although still young at 6 years old, he is a quick learner and wants to please. 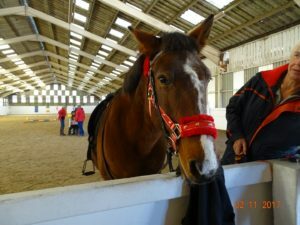 Beautiful Frannie is so popular with our riders that she is used for all our sessions every Thursday. She is a bay mare with a white blaze on her face and as she is 22 years old we are careful not to put anyone too heavy or unbalanced on her back. She really knows her job and keeps very calm whilst her riders are getting on from the mounting platform. She is gentle and intelligent and we can trust her to look after the most nervous riders. We are thankful to Kay for bringing her along every week. Merlin is much loved by his owner Karen who has been bringing him along to Chalkdown since last September. 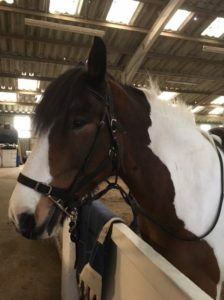 He is a handsome 15 year old piebald cob who spends most weekends competing with Karen and then transforms into a quiet, dependable RDA pony for us each Thursday. Merlin is strong enough to take fairly large adults but we can also trust him to take smaller riders. We are very lucky to have him as a member of our pony team. Comic is our newest recruit. 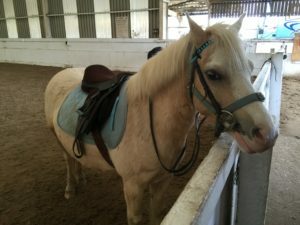 He is a tiny bay pony and is perfect for our smallest riders. Although he is an elderly little chap he is fit and well and just comes along for an hour or two each week. He is brought to us by his owner Claire who is very experienced and volunteers for us as his leader. We all adore him.